How do I view reports on my drip email campaigns? 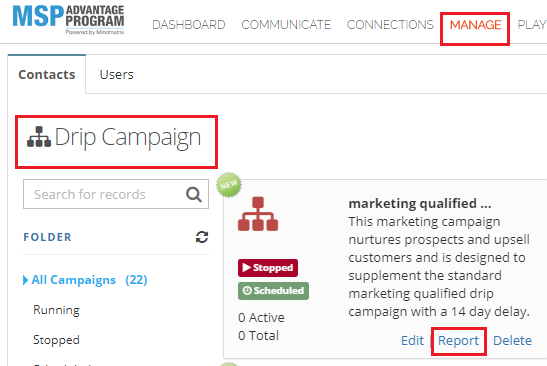 There are three ways to access the reports on your drip email campaigns. The most straightforward method is to go to “Reports”, then “Drip Campaign”. From there, click on the campaign that you would like to examine. This will open up a spreadsheet summary of the individual email performance on the campaign. 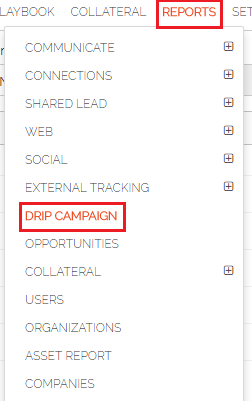 You can also go to “Manage”, then “Campaigns”, and then “Drips”, then click on the "Report" option of the drip that you want to examine. This will open up the “Edit Drip Campaign” window. Click on the “Report” option on the “Views” drop down. This will also open up the spreadsheet.